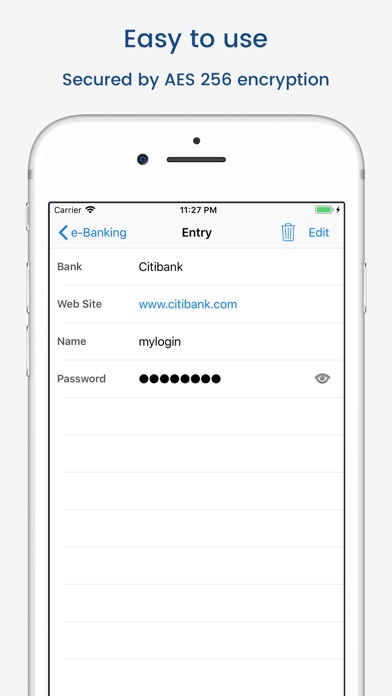 • Securely stores your passwords, credit card information, e-banking credentials, web accounts and other custom data. 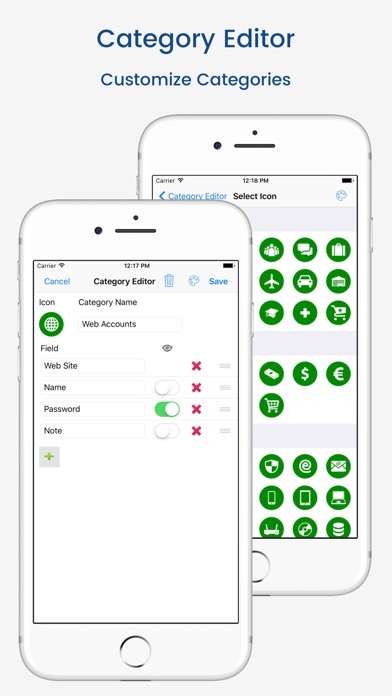 • There is a built in Editor for changing or creating new data Categories. • Search within fields. • Contains no advertisements. • Supports backup and restore of the encrypted data file to the iTunes File Sharing folder. • Export of unencrypted data in CSV format to the iTunes File Sharing folder. • There is an Auto lock feature that can be preconfigured for a specific period of time. 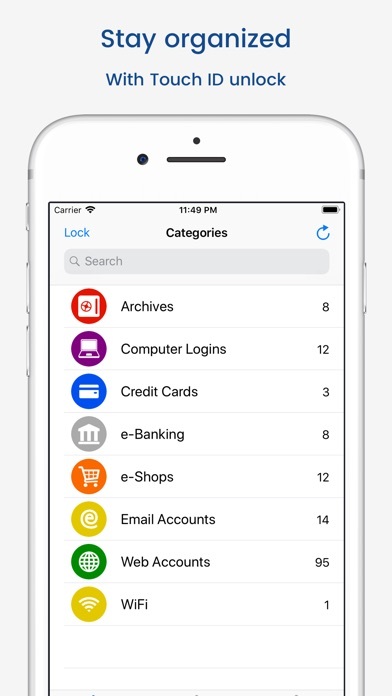 PRO FEATURES, available via single in-app purchase: • Cloud synchronization • Unlock with Face ID • Unlock with Touch ID • Password Generator • CSV Import SECURITY FEATURES • All data is encrypted, including Entry names, Category definitions and the data itself. • Encrypts data using AES or Blowfish algorithms with key sizes of 256, 192 or 128 bits. • When the data file is decrypted, up to all combinations of algorithm, key size and cipher mode of operation (CBC, CFB, OFB and ECB) are tried with the Master password to unlock the data file. This was inspired by TrueCrypt and makes brute force attacks longer. 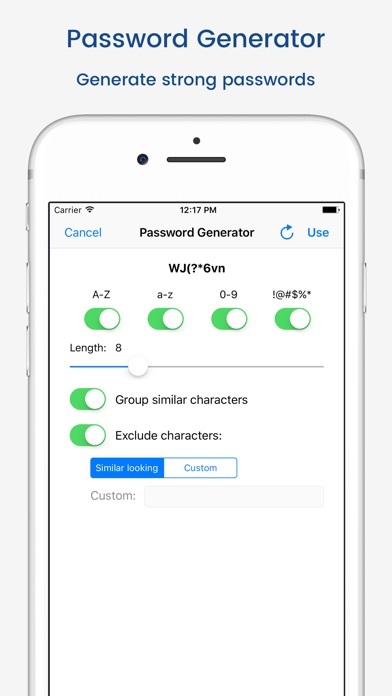 The app itself does not store any hint to the actual cipher, key size or cipher mode of operation. • Uses a randomly generated 'salt' combined with the Master password. Salt helps to protect from off-line dictionary attacks. • The key to open the data file is created by combining your master password with the 512-bit 'salt'. The result is hashed 1000 times by SHA-256. Repetitive hashing makes a brute force attack more difficult. 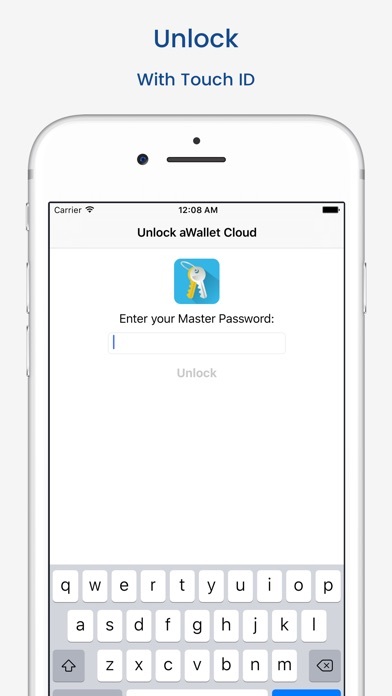 • Supports auto destruction of the data file after a predefined number of unsuccessful unlocks have been tried. For more info see http://www.awallet.org/ If you like this App, rate it in the App Store. If you have any suggestions, just let me know.